The third in my “Story Behind …” series features an image from a recent outing on one of my Over & Sporting Photography (Game Shooting) commissions. This is a good example of how the message of the image may not be completely obvious from the start, and perhaps clearer to some viewers than to others. Firstly the clothing and the conditions set the scene; the tweed jacket and breeks and the colourful socks tell us that this is a game shooting scene, the mud and the boots tell us that this is a typical British winter day. The boots themselves are a great illustration of the great Scottish saying, that applies to most shooting activities – “there’s no such thing as bad weather, just bad clothing.” Shooters, like walkers, are passionate about “gear”, clothing and footwear that “works” is paramount. 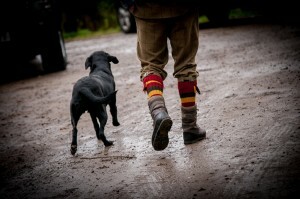 Trust and Loyalty – There is no leash, the dog is walking to heal, there appears to be no doubt to the handler that the dog will remain there at heel. the dog appears determined to remain there. This itself shows a significant level of Training and Hard Work – that level of trust in a dog would not be possible without many hours of dedicated training. Enjoyment – the dog knows what is coming, the body language is showing excitement with the wagging tail, the stance and the poise indicates a level of determination. Above all, to me, all I see is a incredible strong bond of friendship and loyalty despite the physical separation. With a highly trained dog there will be little need for physical communication much will go unsaid on the day. That is what I see, but I know that not all will. Shooters are more likely to make the same connections as I do, but the beauty of photography is that we will all read images differently. One thing I have proved though, is that this image is worth 360 words ….